Cycling to Col d’Albanne the other week I was trying to figure out where the heck the road up was to a little village high in the mountains on the other side of the valley. The village was high atop huge, clearly unclimbable, cliffs with big mountains on each side. Then I noticed a quite incredible looking road hair-pinning up the mountain off to the side and I guessed (correctly, for a change) that this road must somehow go up, over, and around to the village. Of course, when I got home I pulled out the maps. And, a few days later, what a joy it was to cycle. The first half (and a touch more) of the route literally hairpins up the side of a mountain. Somewhat similar to the nearby Les Lacets de Montvernier, it is difficult to photograph how amazing the road is (without a helicopter), but on the road one understands that it is something special. Why is this amazing road virtually unknown? 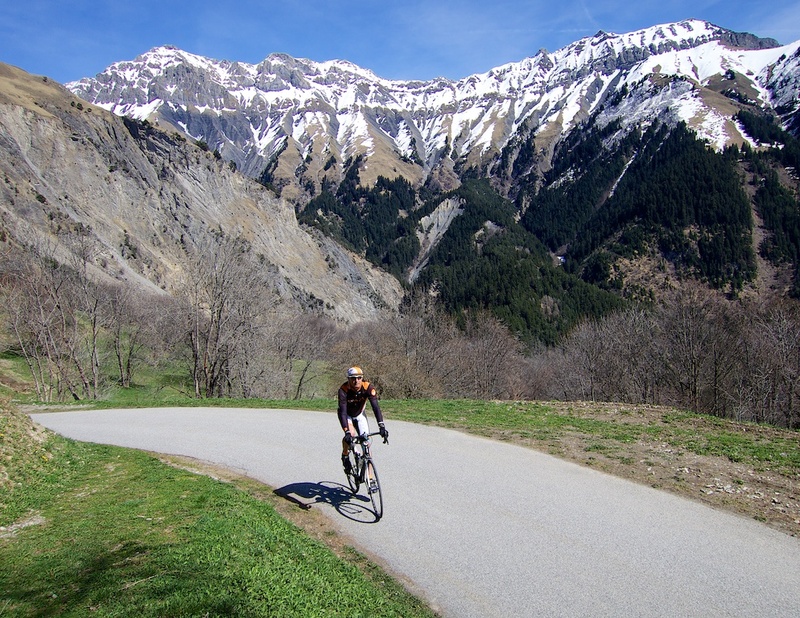 It’s across from Col du Mollard, and Col de la Croix de Fer, beside Col du Chaussy, just down the road from Madeleine, Glandon, and Galibier …. the locals are just spoiled for choice. And the cyclotourists pass through on the highest stuff. Two things stop this from being a top, top climb. First, while there are plenty of almost straight down views of the entire altitude gain (rare) — the valley below is not that scenic and a touch industrial — don’t get me wrong, there are snow covered Alps everywhere. Second, the road literally just ends at approximately 1500 metres. Unlike many other roads in the region, there just aren’t mountain bike options. It is an inaccessible place. But let’s not complain. Awesome. 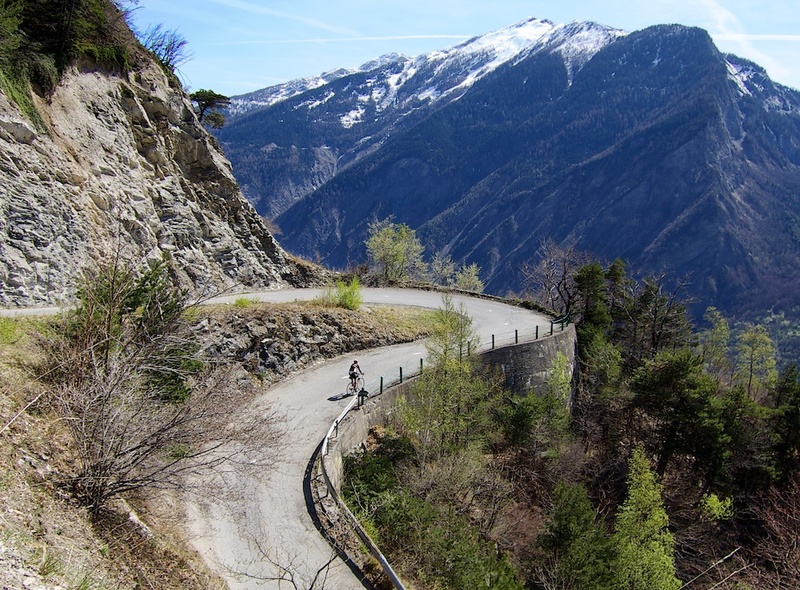 This was one of two very nice, little-known, Maurienne valley climbs cycled today. I’ll blog the other soon. It is difficult to photograph how amazing the road is (without a helicopter), but on the road one understands that it is something special. Jan, excellent, much appreciated. I love getting new route ideas. Will, I’ll be visiting that part of the Alps for a month from mid-June onwards this year, and was considering Montdenis as one of the rides. I noticed on Google Maps that there seems to be a road meandering its way north of Montdenis, and getting up to over 2000m. Are you saying that this road is inaccessible? I can’t get any information on it, because Google StreetView doesn’t cover it. As best I can tell looking at a detailed IGN map, it is a gravel road to an oratoire at just under 1700 metres then it’s unclear to me if it’s an old road or a trail higher. I made a quick route and it looks about 2,5 kms at 15% or so. Possible but you’d want wide tires. Fair enough. 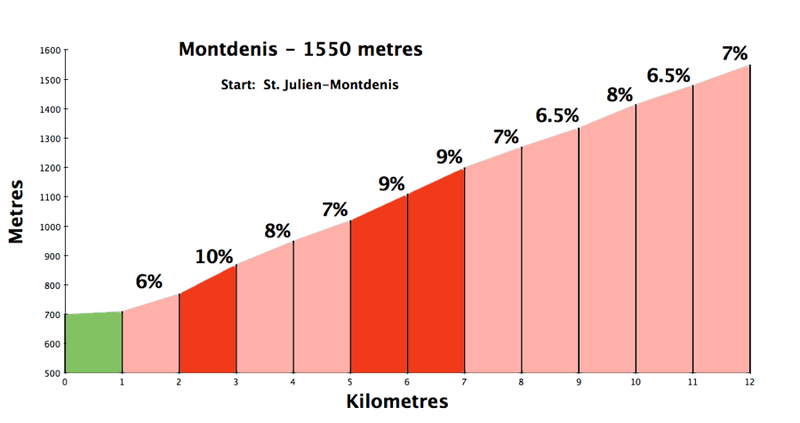 I’m hiring a road bike, so I guess I’ll just stop that climb at Montdenis.